our property for charging our phones and laptops. The Geek's Quad's first power station. Our solar system has evolved and expanded over the past few years. We have added several panels to our solar system and have not downgraded any of them to non-panel status, although now I have the strong urge to name one 'Pluto'. While many readers know our alternative power source here at the Geeks' Quad is solar power, what many probably do not know is that, as with many projects we approach, we do not have your 'typical' solar system. 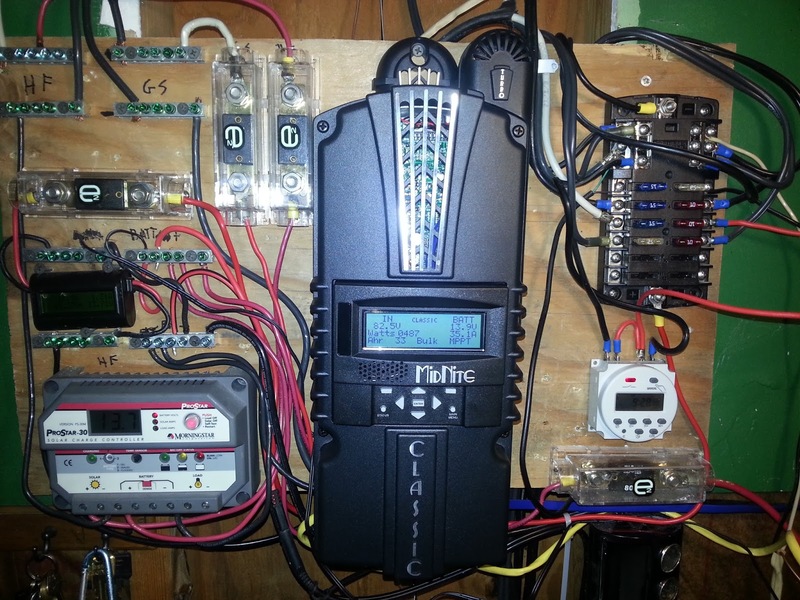 The main differences are (1) we built it ourselves, component-by-component, at a fraction of the cost that solar companies sell installed systems for and (2) rather than convert the generated/stored power to the standard 120 voltage used in houses, we set up our house to use 12 volts for almost everything. More on that later, let's start at the center of the solar system - the sun. As long as we have sunlight shining on our panels we are generating electricity. Solar electric panels are made up of numerous solar cells. A solar cell converts photons into electrical power through a chemical reaction. All light consists of particles called photons. When the material used to build a solar cell is hit with the photons that make up sunlight, the photons are absorbed and through a chemical reaction they release electricity. Each cell produces 0.5 volts of direct current (DC). Since each cell can convert 0.5 volts, a 36 cell panel can output 18 volts, and a 60 cell panel can output 30 volts. 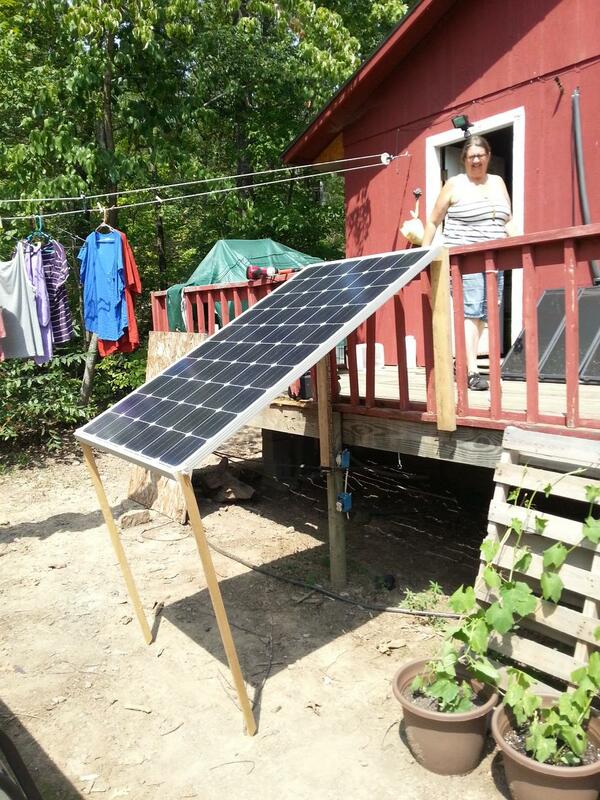 We started out, 4 years ago, buying solar panel kits from Harbor Freight. At the time, these were the most cost effective. Each kit contains three 15 watt panels (45 watt total) for about $130. All solar panels are rated at how many watts they will produce. This rating number is based on a perfect test condition scenario, and you will not see your panels reach this perfect world production, but it is a good number to use when comparing panels. Divide the cost of a panel by its wattage rating and you will have a cost-per-watt comparison to use when comparing panels. Back when we were buying the Harbor Freight panels they were $2.88/watt. Then, about 18 months later, another option became available from Grape Solar. The Grape Solar Panels are 265 watt panels that can be ordered at Home Depot for $370 ($1.39 per watt). We still use our Harbor Freight panels, but to compare them to our newer panels - all 18 of our Harbor Freight panels produce just slightly more power than just 1 of our Grape Solar. With multiple panels (called an array), you need to decide if you are going to connect them in parallel, series or a combination of both. The deciding factor, especially in our case, is if the panels have any shadowing throughout the day. If all the panels are connected in series (one long chain) and a shadow falls on one of them the entire array stops producing power. 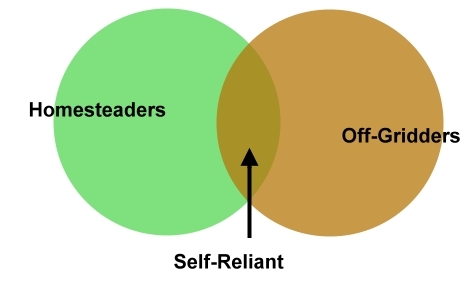 If, on the other hand, the panels are connected in parallel and a shadow falls on one, the others will continue to produce power. At this point, you may be asking 'Why not always connect them in parallel?' I am not going to go into all the science, but in parallel, the current from each panel gets added together - more parallel panels means higher currents which means heavier wiring is required. Each parallel set also needs a pair of wires going from the array to where your system is being set up in your house. so we could fit two vertically for a 2x2 grid. Back to our specific situation. Our original Harbor Freight panels span the entire length of our south facing deck, about 30 feet. The length of this array and the fact that we sit low in a valley caused us to connect these panels in parallel. As the sun comes up in the morning the panels on the west side of the array can be lit for an hour or more before the panels on the east side of the array, and in the afternoon as the sun dips behind the mountain to the west the opposite shadowing occurs. If these panels were wired in series we would lose about 3 hours of power production from them each day as either end was still in shadows. Our Grape Solars, which sit in our south garden (connected to the south deck) are arranged in a more compact block. We started out with just a single Grape panel, when we added a second we wired it in series because of the smaller footprint east-to-west, we did not need to worry about shadowing. When we expanded by adding two more Grape Solars we mounted the new ones below the two existing ones so the east-west footprint remained the same. We then had the opportunity to purchase two panels similar to the Grape's at a great price and those two made a third column of two which we added to the east side of the existing block of four (2 panels wide by 2 panels high became 3 wide by 2 high). With this third column, we started to notice a bit of shading on the newest column when the original four were fully lit as the sun topped the tree tops in the morning. I broached the question with Alan that we should experiment to see if there would be less shading if we moved the new panels to the west side of the original panels and thus it would catch shade in the afternoon rather than the morning. We mounted a panel sized piece of cardboard to the west of the panel array so we could compare the time we had shadowing on the new panels to time there would be shadowing on them if we moved them to where the cardboard was located. While running the experiment, Alan came up with a completely different solution, since we had room for both the new panels as they were currently positioned on the east side of the array and the cardboard as a placeholder for panels on the west side of the array, we should just buy one more set of panels! (He had already done the calculations to determine what we would need to do to expand our system to handle the additional panels). At our next meeting of our self-reliance group, I was sharing this story and I just got to the part about how we were running the experiment to determine which side to place the panels on and two other guys, both with solar set-ups, said 'just add two more panels'. to which my reply was - it must be a guy thing. My experiment was to determine the optimal arrangement of our existing 6 panels, but somehow all three men, with no collusion, decided we needed to instead add two more panels. Now there's a bunch of Grapes! So, our most recent expansion, which was a few weeks ago was the addition of two more of the Grape panels. At this point, the east-west span of this array has expanded to the point that we decided to re-wire the panels in a combination of parallel and series connections. The eight panels are in a grid - 4 across by 2 down. Each vertical pair is connected in series and then each of these pairs is connected in parallel (from left to right) since we can have shadowing on either of the end pairs just as we do the Harbor Fright panels. In this way, as shadowing disables one pair of the 'Grape' panels at the beginning or end of our day the other 6 are still producing power. I can now run two dehydrators on sunny days and still have a fully charged battery bank by sunset. We still have a bit of tweaking to do with balancing some power draws, but we have been experimenting and we can even run an air conditioner on sunny days! with the amazing Whizbang Jr.! Enough about solar panels, now that they are wired together, where does the wire go? The wiring is connected to a device called a charge controller. In our case, it is a thing of beauty called the MidNite Solar Classic 200.The charge controller is responsible for protecting your batteries from damage during charging. The batteries must not be charged with too much current, too much voltage, or over charged. The charge controller is also responsible for charging the batteries in the most efficient manner, wasting as little power as possible. And some charge controllers also protect the batteries from being too deeply discharged by automatically disconnecting the loads (lights, fans, radios etc.) when the voltage gets too low. 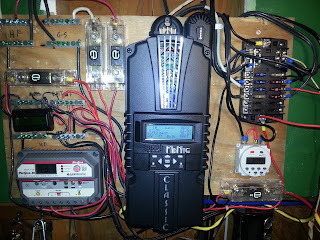 The MidNite Solar charge controller has an optional accessory called the Whizbang Jr. (yep, that's its real name). Every amp of power that flows in or out of the battery bank goes through the Wbjr. The Wbjr measures all the current going into the battery bank during charging, and out of the battery bank when it's used, and it acts like the gas gauge in your car. Put gas into the tank at the gas station and the gauge goes up. Drive around and it goes down. That way you know how much gas is left in the gas tank. The Wbjr does the same for your battery bank, letting you know how much capacity is left at any given time. It has tons of features and Alan has access to all the data from his smartphone so we can check in on it when we are gone. From the charge controller the power can go directly to power devices we are using or into the battery bank to be stored for future use. Our battery bank consists of eight 6 volt 208 amp/hour golf cart batteries.Golf cart batteries are designed for slow power draws over long periods of time, which is what we are looking for in household use. If you connect batteries in series you increase the voltage (two 6 volt in series produce 12 volt). If you connect batteries in parallel you increase the amperage (those same two batteries connected in parallel would still produce 6 volts but for 416 amp/hours). With eight batteries to connect together in our battery bank we had a lot of options. However, the best choice is to not exceed two parallel strings of batteries. Two will have a good balance when charging and discharging. Batteries have slight internal differences, called internal resistance. As you add additional parallel strings, these differences cause problems with equal charging and discharging. Therefore, we have two parallel strings of batteries - each string is 4 batteries in series. This means we have a 24 volt / 416 amp/hour battery bank. (6 volt x 4 batteries in series = 24 volts and 208 amp/hour x 2 parallel strings = 416 amp/hours). Enough of the math, actually there is never enough math, but that's my personal opinion. Here is a quick review: sunlight hits the solar panels and is converted to electricity, that electricity flows through wiring to the charge controller, from there power can be used directly throughout the house and all excess power is stored in the battery bank. If you have been following the numbers, you may have realized that something isn't right. In the beginning I said our house was wired for 12 volts, but our battery bank is 24 volts. This is where the buck-boost converter comes in to play. The buck-boost can be set to a specified voltage to provide a more regulated service, or in our case it it can be use to step down the voltage from 24 to 12 volts. There is one other major device in our solar system - the inverter. This takes 12 volt DC from our batteries and outputs 120 volt AC. We only use this for one appliance in our house, the refrigerator which is a converted chest freezer but I will leave that story for another blog post. You may be thinking 'Wouldn't it be easier to run everything off the inverter, then the house would have normal 120 volt wiring?' We chose not to do this because of the amount of loss during the inversion process. You may recall that I stated we do not take the typical approach, the typical approach is to build a larger system, purchase a larger inverter and connect the inverter into you house's 120 electrical system. We wanted to change our lifestyle, design a system to meet our needs and realize one of our goals of self-reliance without breaking the bank. So, how much did it cost? Ours has been a learning experience with several upgrades along the way. Below is an itemized list of the main components of our current day system. I have not included the Harbor Freight solar panels as they are such a small portion of our production capability now. Our original system was under $2000 and was very adequate for meeting our needs, but as we have found with other areas of self-sufficiency, like water consumption, if more is available you tend to use it. One of our goals in setting up our own solar system was to provide an alternative energy source that did not require the sales pitch that every solar company out there seems to include include, which is 'and we'll provide the financing'. We proved we could set up a system for under $2000 and then over a few years expanded it to a more robust system for under $5000, not the typical cost of an installed system ($25,000-$35,000). And, in writing this post I have determined who Pluto is in our solar system. It is the Harbor Freight array. Now that we have eight of the Grape Solar style panels, and all of the Harbor Freights together equal about one more Grape Solar that would make them the 9th! Most of you know that I love to can, especially pressure canning. But this week I am going to talk about dehydrating. As the gardens start producing at full force and I find myself elbow deep in tomatoes it's time to start filling up the dehydrators. rotated during the process for even drying. 1. Preserving Small Batches of Produce. Much of what I harvest out of the gardens is not enough for a canner load, at least not before some of it goes bad. For example, my strawberry beds are still very small, so I only get a handful of berries each day. In order to be able to make jam from my home-grown berries I could turn on the freezer and run it throughout the season to preserve each handful of berries as they accrue until I have enough for a batch of jam, but this would either require the sun to be very cooperative in charging our batteries, or require the occasional use of our generator, which seems a waste when I could simply run the dehydrator on sunny days to dehydrate the strawberries. The other advantage to this option is that once dehydrated the berries can sit in the pantry for months if I don't feel like making jam in hot weather. One of the best jams I made last fall was made from wild elderberries I had picked and dehydrated in August and pears I had canned the previous fall. On a side note, if you dehydrate strawberries for a specific project, be sure to set aside some extras because if you taste test them you will find out they taste like Strawberry Twizzlers. up the slices will save more space. 2. Saving Space With Large Volumes of Produce. Early this spring we received a 50 pound bags of potatoes for free. Then, a few weeks later we received another 50 pounds, and being early spring these spuds were not going to store for very long. Well, we ate a lot of potatoes, I canned a lot of potatoes, I canned a lot of meat with potatoes for soups and stews and we still had a lot left. You have to take a couple extra steps when dehydrating potatoes or you will end up with gray slices - they will still taste like potatoes... if you can convince yourself to eat them. I list the the basic steps for dehydrating at the end of this post, including how I dehydrate potatoes. The 50 pound bags of potatoes each contained ten 5 pound bags so as I was processing them it was easy to determine that I could fit a 5 pound bag of potatoes into a 1/2 gallon canning jar. This was keeping them stored as potato slices, I am going to break some of them into pieces that can be thrown into soups and stews and I will be able to fit 2 to 3 times as much into the same size jar. Dehydrating is also a great space saver for the heavy producers in my garden. I do can a fair amount of tomato sauce to be used in other canning projects (meatloaf, meatballs, stews, etc.) but my favorite way to preserve tomatoes is also the best space saver - tomato powder. I slice the tomatoes and dehydrate them until crispy. Then process them in the food processor with just a slight amount of corn starch until they are pulverized to a powder. I can then add this tomato powder to lots of dishes as a 'stealth vegetable'. I have also grown a loose leaf cabbage this year (think kale) and have dehydrated it with plans to make vegetable powder from it as well. 3. Keeping a Variety of Vegetables on Hand. I am not a fan of canned vegetables - that is the ones sitting in cans on shelves in the grocery store. Before we moved off grid, I would buy my 'long term' vegetables in the frozen food department. Well guess what, sometimes I still do ...and then I bring them home and dehydrate them! Yes, you can dehydrate vegetables that have been frozen. I do this for vegetables I don't grow in our gardens or if I find something I would like to add to my pantry. The other day we were at a store that had locally grown rhubarb in their freezer section. My rhubarb will not be ready to harvest until next year so I picked some of the frozen rhubarb up to process and add to my pantry to go along with my dried strawberries. Solar or electric? While there are many plans out on the internet for solar dehydrators, my method of choice for off-grid dehydrating is to use our solar generated electric power to run our electric dehydrators. Using electricity to generate heat is not an efficient use of power, that is why we do not have a toaster, waffle iron, coffee maker, blow dryer, etc. However, I feel the electric dehydrators have enough advantages over the solar dehydrator to warrant the power usage. I just make sure I only run the dehydrators on sunny days when we are creating an excess of power. and two trays of blackberries. With the electric dehydrator I know I will have a steady heat throughout the entire drying session, whereas a solar dehydrator has heat variations due to cloud cover, wind, etc. Also, from those I have talked to who do use solar dehydrators, the dry time per batch is usually more than a day which means there is more chance of mold or spoilage occurring in between the drying sessions. I feel I get safer, quicker results using my dehydrators and since I am using excess power we are generating on sunny days it is still free power from the sun. some seeds for next year's crops. When we were researching dehydrators, our goal was not the biggest and the best, but rather the most power efficient. We chose a model from Open Country. This is one of the basic styles with six round stacking trays. The top cover contains the heating element/fan. We did make an addition of creating screens that fit in the trays as small produce like peas tend to fall through the grates in the trays as they shrink during the drying process. We have been very happy with our choice, in fact it is efficient enough that we purchased a second and run them in tandem when we have a lot of produce waiting to be dehydrated. for $2 each with plans for using them in a solar dehydrator. But for now I use them as extra trays for drying in the oven. Back up and 'stand-by' drying option. Using the electric dehydrator does not mean every batch gets dried on the day I start it. Even on optimal sunny days, we do not have a long 'window' of full sun on our panels. Being situated in a north-south valley means we need to wait for the sun to climb up over the eastern mountain in the morning and then it dips behind the western mountain in the afternoon. And, our time is even more limited in the summer due to the arc of the sun and the tree cover. Our shortest solar days are actually mid summer when we only have full sun on the panels for about 5 hour a day. I always monitor our power usage while drying and turn off the dehydrator(s) if the power starts being pulled from the batteries, meaning they are no longer using 'excess' power. This is where my back-up solution comes into play - our oven. Our stove is propane and, in most cases, the pilot light in the oven provides enough heat to 'hold over' the trays that are partially dehydrated until the next day. Just remember to prop the oven door open slightly so the humidity does not build up and defeat the purpose - I use the handle of a spatula. I have learned the hard way to not trust this method for wetter produce such as berries and tomatoes. If they have only had 4-5 hours in the dehydrator and I need to turn them off, I refrigerate them until I can return them to the trays and put them in the dehydrator again. Otherwise they tend to mold. On the other hand, if I have an abundance of herbs, I often dry them from start to finish in the oven. The Basic Steps. Dehydrating is a very simple process with no exact time to follow. You have to judge that a batch is finished by the feel and texture as well as the conditioning step below. 2. Peel/Slice/Dice as needed. When slicing or chopping consistency is important for even drying. 3. (Optional) Treat fruits/vegetables that may turn brown due to oxidation. We grind up vitamin C tablets and dissolve the powder in water. As we slice the vegetables/fruits we place them in the vitamin C water. We keep them in this water until we are ready to start the dehydrating, anywhere from a few minutes to overnight. blanched and which were raw. 4. Steam or water blanch. Not all produce needs to be blanched. The rule of thumb is that if a vegetable is usually cooked before serving, then it should be blanched before drying. Blanching helps speed the drying process and also the cooking process after re-hydration. I prefer steam blanching for preserving nutrients but I water blanch potatoes to aid in color retention. 5. Place food on tray in a single layer, not touching to prevent edges from sticking together. 6. Dry until crisp - rotate trays every few hours and the slices may also be flipped over. 7. Turn off dehydrator and allow food to cool. 8. Condition by placing in zip-loc bag or canning jar over night. This gives time for any remaining moisture to 'even out' over the batch. Check for moisture the next day and dry for extra time if necessary. 9. Vacuum-seal or vacuum-can. We made a vacuum-canner which we use to vacuum-pack dry goods in canning jars. from humidity in the summer and also allows for long term storage. So, while I love to pressure can and enjoy the versatility and creativity of what I make in my canner, I appreciate my dehydrators for the ease and speed with which I can process the produce as it starts flowing out of the gardens in the heat of summer. Then, as the weather turns cooler, I can pull out the jars of dehydrated goodies, start cooking up some larger batches of jams, soups and various one pot meals to can for our winter larder. 'Upper Extension' of the Bottom Garden this year. We had a very mild winter this year, not once did I have to warm rocks on the wood burner to take down to my worm farm at night to keep them from freezing. Our herd of worms were very productive this winter, providing us with about 10 bottles of worm juice for the start of this year's gardens. We also have had no measurable snow fall… yet. The balmy weather in January and February means I was getting antsy to start gardening projects. Just like the start of years 2, 3 and 4, as we approach the beginning of year five of our off-grid life I have plans for more garden expansions. As you may recall, last year I created the ‘bottom garden’ on the bottom half of a sunny slope just a little south of the house. When clearing out area for the bottom garden I determined the upper limit based on how many rocks I would have to remove if I wanted to take it any further up the slope. I convinced myself there was too much shade cast on the upper slope and thus, I didn’t need to put in the effort to clear that rockier area. And then, throughout the garden season I tracked the amount of sun on the upper slope and confirmed that with the most recent trees we removed to open up our ‘solar window’ this upper slope would make a good garden extension. Unfortunately, this meant we had to remove all those rocks I chose to ignore last year. later pulled that log out using Stormy, our Isuzu Trooper. We started by clearing brush, which was about 80% briers and cutting out small saplings. We then set to work on the rocks. 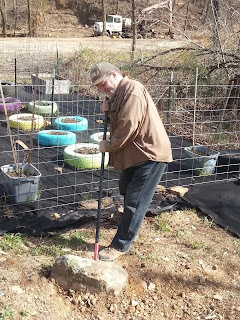 While our property is very rocky, most of the rocks are small enough to pick up by hand and toss to an area outside of where the garden fence will be going. Once all these were removed it was time to start digging up the ‘icebergs’ – those pointed edges of rocks sticking out of the ground that I had kept tripping over while doing the other work. Just like icebergs, we never knew how big these rocks actually were until we attempted to pry them out of the ground. 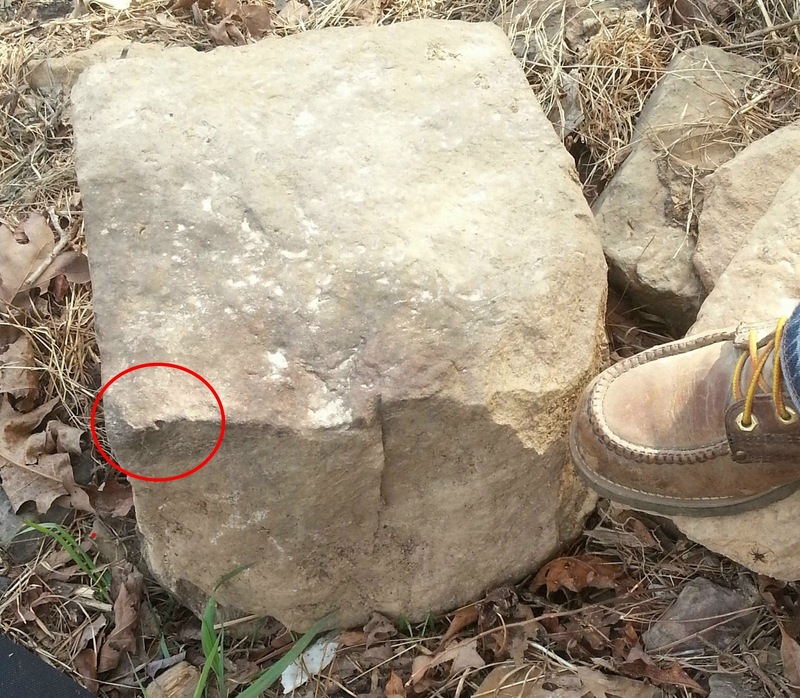 Most were pried up fairly easily as most rocks also tend to be fairly flat on the property. I found that if you were able to budge the rock on the first couple of tries with the crowbar, then it was likely to come out relatively easily as the rock was only 2 to 4 inches thick and we were able to get the crowbar under it for leverage. largest rock we tried to move. However, after removing several dozen rocks by hand and by prying them up there were still a few that were too large for the crowbar. We made a trip to Tractor Supply and bought a very large pry bar – 16 pounds and almost six feet long. With a lot of effort, and sore muscles, we were able to get all but one of the largest rocks out of the garden. The large pry bar (believe it or not, we haven’t named it, yet) has a point on one end and a short flat blade (think spatula) on the other and between the two we could work the bar under all but one of the rocks to get enough leverage to work them out of the ground. As for the one rock that remains – I am cutting the bottom out of a plastic tote, placing it over the rock and creating a small raised bed. I just have to remember to not dig to deep in that planter or I may break my trowel. small piece of rock that was still sticking up out of the ground. garden. The red circle shows the part that was above ground. While working on this upper extension to the ‘bottom garden’ I also decided to create a lower extension as there is a flat area at the bottom of the slope. We had ended the original area of the bottom garden at the bottom of the slope not because of rocks but because of a tree that would be inside the garden area if we went any further in that direction. This year I decided I would either work around the tree or have Alan take it down for me. My plan for this area is to make it into a berry patch. I cleared the briers, saplings, etc. from this area and then Alan and I measured it to determine how many feed lot panels we would need to fence it in. back on top of the landscape fabric to hold it in place. While measuring, we discussed the various possibilities, including the life expectancy, or lack there of, of the tree at the edge of the current garden. We determined that, as this section of the property is not as flat as I thought (the brush and briers were hiding a dip) the feed lot panels would better fit the contour of the land if we created a new garden that started several feet past the tree rather than extending the current garden in that direction. This is also the area where we park Hoss, our large king cab dually pickup we use for hauling. We can leave his parking spot and make a 16’X16’ berry patch (feed lot panels are 16’ long) or we can find a new parking spot for Hoss and make a 32’ X 16 foot berry patch. I am opting for the 16’X16’ this year so I can already start planning for another extension next year. While all this hard labor has been going on outside, the garden activities are also in full swing inside the house. Every year I try to start some of my indoor seedlings earlier in the season. I have several plants I grow that have fairly long growing seasons and I want to give them as much of a head start as I can before transplanting them outside. The problem is I only have one south facing window, the kitchen window over the sink, and grow lights would require way too much power. With the limited natural light it is always a balancing act once my seedlings germinate – rotating the various flats so they all get enough sun so they do not become spindly before I can plant them outside. It has been so mild the past couple of months I have been able to put my seedlings outside much more than in past years. Seeds lined up on damp paper towel for germination. I did have a lower germination rate on several varieties of seeds this year. I started them as I always do, including keeping them close to the wood burner to make sure they are warm. My only thought is that the mild weather has meant we have not had a fire in on some days, and even a few nights, so while the temperatures have been mild, that has actually caused the house to be a bit cooler. I took stock of which plants I had a shortage of and set about germinating more seeds. I have been wanting to experiment with soilless seed germination and decided to give it a try. I placed a paper towel in a glass casserole dish, moistened it and laid out rows of the various seeds. I covered the dish and placed it in my oven as the pilot light keeps it nice and warm. Within a day some of the seeds had sprouted. As each variety sprouts I transfer them to the seed starting flats that are filled with a seed starting mix. This method is also a good way to start older seeds that may have a lower germination rate because you are only planting the seeds that have been proven viable rather than filling starter containers with non-viable seeds. Part of the excitement of each year’s garden is determining what new plants and varieties I want to try growing. Some new garden family members are chosen for the challenge to see if I can grow them, while others are chosen to replace varieties that were not successful producers. My two tomato go-to varieties have been Amish Paste and German Red Strawberry. Both are determinate varieties which mean they all ripen within a short season (good for canning) rather than having a few ripen at a time over the entire summer. Both varieties are also very meaty, another plus for canning, however I tend to get frustrated with the German Reds because while they are supposed to be large and shaped like strawberries, many of mine are irregular shaped – more like conjoined strawberries. While they have a single stem, it looks like two tomatoes grew together. This year I am adding two new tomato strains to my arsenal – St. Pierre and Betalux. I am currently disappointed with the Betalux for their poor germination rate and failure to thrive, but maybe they will surprise me. I was pleased with the ginger I grew last year, so this year I have added tumeric to the list. I also have plans to try more herbs as well. I have not had any luck with carrots since I started gardening . My plan was to not grow carrots this year, but then I remembered I did have success in saving carrot seeds last year. Carrots are a biennial plant, which means they do not produce seeds until their second year. Therefore, you must earmark a couple of your plants as seed producers and not harvest them. Carrots seeds I saved from last year - time for an experiment. In our area, it is mild enough that I can leave them in the ground over the winter and the next year they shoot up long stems with flowers that look like Queen Anne’s Lace (which is in the carrot family). Allow the flowers to dry on the plant and then cut them off into a paper bag. I stored them in the paper bag last fall with all the other seeds I saved from my 2015 garden. When I saw the bag in with all my other seeds from last year I decided I had to try carrots one more time just to verify my seed saving worked. I have always been able to grow carrots plants, they have just never produced any decent carrots, so as long as I get carrot plants I will consider the biennial seed saving successful. Mix up a thick flour paste – 2 teaspoons flour to 1 teaspoon water. You want the paste to be thick so it dries quickly and does not start the germination process. Use a strip of toilet paper (unused!) that is an easy length to work with. I made mine about 4 feet long as that length would become a row in my raised beds. Cut the toilet paper in half length wise and then fold the strips in half to make a crease down the entire length of the now half-width strips of toilet paper. Using a toothpick, place dots of flour-paste along the crease line. Space the dots the recommended distance for your seeds. In my case the carrot seed spacing is every two inches and toilet paper squares are 4 inches long so I placed a dab about an inch on either side of each perforation of the toilet paper. Use the same toothpick, it now has a sticky end, to pick up individual seeds and place one on each dab of paste. As for my carrot seeds, I was a little freaked out when I shook out my saved flower heads and discovered that individual carrot seeds looked very similar to ticks! Refold the paper strips along the crease to encase the seeds in the paper strip and allow to dry. Note: as I placed the dabs of paste for each seed I used the toothpick to make a streak of paste toward the long edge of the paper strip, this helped glue the paper strip together more firmly. When ready to plant, dig a furrow the recommended depth for your seeds and plant the strip. Enough about the inside garden preps, time to go back outside. With the briers, rocks and trees cleared along with the landscape fabric laid and the fencing around the upper extension, now the hard work starts - bringing in truck loads and carrying it by 5 gallon buckets to fill various raised beds and containers. You may have guessed that the growing pains we suffer from are sore muscles.